t@b ZS4 is video editing and compositing software with more than 150 built-in video effects including excellent color and chroma keying. Other features include custom output video width and height, unlimited tracks and sub-composites, custom speed and direction change for video and audio, and the ability to slave effect and compositing controls to audio wave forms. Produce video with a resolution of 8x8 or 16000x16000 (~200 Megapixels / frame) and many sizes in between (custom). Looping of both audio and video signals simultaneously, with adjustable cross-fade on loop boundaries. Version 0.958 is a freeware program which does not have restrictions and it's free so it doesn't cost anything. For security reasons, you should also check out the ZS4 Video Editor download at LO4D.com which includes virus and malware tests. Additional screenshots of this application download may be available, too. 4.53 out of 5 based on 15 ratings. 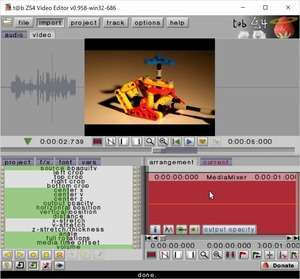 t@b ZS4 Video Editor for win32 has a presence on social networks.